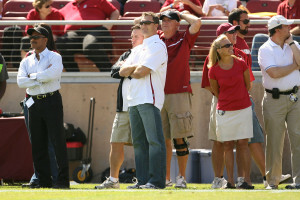 Former Stanford Cardinal and NFL superstar John Lynch during Stanford's 24-16 win over UCLA on October 3, 2009 at Stanford Stadium in Stanford, California. Before his senior year on the Farm, John Lynch ‘93 had a decision to make. With a minor league baseball contract with the Florida Marlins in hand, it seemed that professional baseball was his inevitable future, especially given the fact that, on the gridiron, he was benched midway through his junior year after transitioning from quarterback to safety. However, a meeting with legendary coach Bill Walsh, who had just taken over the Stanford program, changed everything. Walsh’s prophetic words came true as Lynch went on to be drafted in the third round out of college, won Super Bowl XXXVII with the Tampa Bay Buccaneers, made nine Pro Bowls, and tallied 1,058 tackles in his 15 seasons with Tampa and Denver. Widely revered for his intimidating presence and jarring hits, Lynch was named the 10th most feared tackler of all time by the NFL Network, and in 2011 he was inducted into the Stanford Athletics Hall of Fame. Although he is now busy spending time with his four children and broadcasting NFL games for Fox, Lynch maintains close ties with the Stanford football program and, in particular, his friend and former teammate David Shaw ‘94. “At one point, I was a quarterback at Stanford throwing passes to David Shaw,” Lynch said. “His dad, [former Stanford defensive coordinator Willie Shaw], coached me. I was thrilled when David got the job. Lynch also noted that he has really enjoyed watching the resurgence of Stanford football in recent years, with the team playing a similar type of power football that was prevalent on the Cardinal squads he played on in the early ‘90s. He added that the similarity of Stanford’s style to many SEC teams, as well as the growing number of Stanford players in the NFL, has rapidly changed the perception of the Cardinal in the media. Furthermore, Lynch believes that Stanford should be a perennial powerhouse for years to come due to the solid foundation Shaw has built. Lynch also played a large part in contributing to the program’s growth by making a significant donation toward the creation of the team’s new locker room. Lynch’s family is recognized on a plaque in the locker room in honor of the people who donated at least $100,000 to the renovation. Due to his commitments broadcasting NFL games every Sunday, Lynch has not had the opportunity to attend many Stanford home games in recent years; however, he will be in attendance for Stanford’s clash with Oregon on Thursday, Nov. 7, and is looking forward to seeing his friend and fellow former Bronco John Elway ‘83 have his jersey retired. In anticipation of the game, Lynch offered his own solution for stopping the Ducks’ juggernaut offense. A game plan that’s just what you would expect from the All-Pro strong safety. Sunday’s contest in Phoenix between the Cardinals and the Falcons saw season-high performances for two Stanford graduates and current NFL rookies: Arizona running back Stepfan Taylor ‘13 and Atlanta tight end Levine Toilolo ‘13. Taylor finished with 38 yards rushing on 14 carries while Toilolo notched three receptions in the Cardinals’ 27-13 victory. John Lynch was the analyst for the Fox telecast on that game.